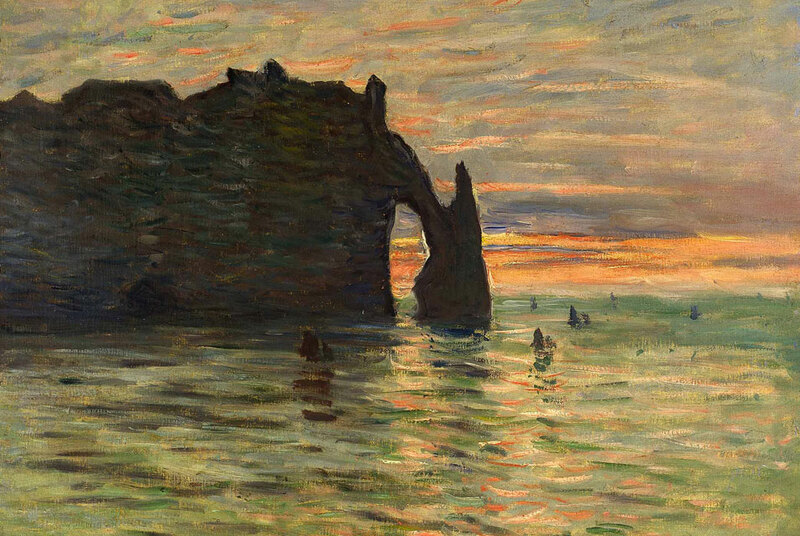 Claude Monet, "Sunset at Étretat", 1883. Musée des beaux-arts, Nancy. MADRID.- This coming February, the Museo Thyssen-Bornemisza and Fundación Caja Madrid are presenting the exhibition "Monet and Abstraction". It offers a survey of the work of the great French Impressionist painter from an innovative perspective and one never previously employed in the context of a temporary exhibition of this scale and importance, namely the artist's relationship with the development of abstraction in the second half of the 20th-century. From his ethereal London landscapes to the monumental depictions of his garden at Giverny where he spent the last forty years of his life, the exhibition looks at how Claude Monet's permanent obsession with capturing the instantaneous led him to break down pictorial representation to the point of reaching the threshold of abstraction. It also analyses how, around the middle of the 20th-century, the young generation of European and American abstract artists rediscovered his art and elevated the figure of Monet to the status of undisputed prophet of the material-based trends within abstraction. Monet thus came to occupy the fundamental role within the history of art that he still maintains today. Jackson Pollock, Mark Rothko, Willem de Kooning, Sam Francis, Joan Mitchell, Adolph Gottlieb, André Masson, Philip Guston and Gerhard Richter were among the young artists who turned back to Monet. The present exhibition now offers the chance to see their work in the context of a fascinating dialogue with that of the Impressionist master, revealing numerous connections. Exhibiting Monet's painting in this new way allows for an analysis of the important influence that he exerted on the development of certain aspects of abstraction in the second half of the 20th-century and hence his key role in the development of modern art. Monet was undoubtedly the most celebrated and prolific of the French Impressionists, but he was also the most independent and innovative. His obsession with capturing a sense of the instantaneous, his interest in issues such as the perception of nature and his need to express his personal experience solely through pictorial means led him to break down pictorial representation into an almost abstract atmosphere. Monet's death in December 1926 passed almost unnoticed within the art world of the day. His Grandes Décorations comprising the "Water Lilies" series, donated to the French State by the artist himself in 1918 and placed on display in 1927, one year after his death, were largely ignored for decades in the Musée de l'Orangerie in Paris. In the early decades of the 20th-century the norms of the new avant-garde movements prevailed, primarily based on the concept of "construction". As a result, Monet's work, like that of most of the Impressionist painters other than Cézanne, was considered out of date and was consequently forgotten. The rediscovery of Monet did not come about until the mid- 20th century when young artists of the triumphant Abstract Expressionism movement in the United States began to look at his works with a fresh eye. The emphasis on paint and its application in his work, his "all-over" technique, his loose brushstroke and sketchy forms were nothing less than a revelation both for the young generation of Abstract Expressionists in the States and for the followers of European Informalism. As is habitually the case, the exhibition is divided between the galleries of the Museo Thyssen-Bornemisza and those of Fundación Caja Madrid. The exhibition opens with a room devoted to the impact that the work of Turner had on Claude Monet during the trips to London that Monet made between 1899 and 1901. A comparison of Turner's work with Monet's paintings of the Thames allows us to appreciate how the play of light across Turner's sparkling pictorial surfaces and his loose, free brushwork influenced Monet's subtle effects in his urban landscapes bathed in the London fog. In addition, the presence in this room of the work of Gerhard Richter, who also executed a series inspired by London, establishes a connection with contemporary abstraction. Monet's sunsets reveal his interest in depicting the changing and ephemeral effects of evening light on the picture surface. The way in which he transformed the rhythms of nature into the expression of his own emotions through a loose, free technique in which the study of colour became the true protagonist, anticipates the chromatic abstractions of later artists such as Mark Rothko and Adolph Gottlieb. In the rooms devoted to the subject of Water lilies - one of the most important chapters within the artist's late output - Monet reveals a growing interest in reconciling a representative type of art, which he never fully abandoned, and a defence of the material aspects of the paint surface. These works mark a shift in his art from narration to abstraction, a process that is related in the present exhibition to the subtle abstraction of the American painter Helen Frankenthaler. The variations of light, time and atmosphere and the contrasts of forms that arise from the reflection of vegetation on tranquil water captured by Monet in a number of his series were crucial for later artists such as Clyfford Still and Barnett Newman. Their brilliantly coloured shapes with strong effects of backlighting must inevitably be related to the work of Monet. The innovative technique used by Monet in the last years of his life paved the way for the abstract idioms of the 20th-century. In the final rooms of this first part of the exhibition, paintings from Monet's last period establish a dialogue with abstract works by Jackson Pollock, Lee Krasner, Mark Tobey, Philip Guston, Esteban Vicente, Willem de Kooning and Cy Twombly. Along with the water lilies, the flowers, trees and Japanese bridge in his garden at Giverny were Monet's preferred subjects during the last years of his life. The loose handling of these paintings, in which the paint sometimes runs across the surface of the canvas, anticipates the style and technique of the Abstract Expressionists many years later. During the 1950s various young artists such as Joan Mitchell, Jean-Paul Riopelle, Sam Francis, Zao Wou-Ki and Ellsworth Kelly made Monet's house and garden at Giverny a place of pilgrimage. As can be seen in this section of the exhibition, the discovery of works that remained in Monet's studio provided a crucial stimulus for many key figures of abstraction. Monet's influence can be traced in the work of numerous abstract artists of the second half of the 20th-century for a wide variety of reasons. This room presents some of the clear affinities between the work of the French Impressionist painter and artists such as Jean Bazaine, Maria Elena Vieira da Silva, Robert Ryman and Gerhard Richter. The second son of Adolphe Monet and Louise-Justine Aubrée Monet, Claude Monet was born in Paris on 14 November 1840. For financial reasons his family moved to Le Havre where he spent his childhood and where he met Eugène Boudin, who encouraged him to paint landscapes out of doors. In 1859 he moved to Paris to complete his training, attending the Académie Suisse. Following a stay in Algiers where he undertook his military service, and a brief stay in Le Havre, he returned to Paris. In the 1860s he coincided with Jongkind in Brittany, and with Bazille, Sisley, Renoir and Cézanne in Charles Gleyre's studio. In 1870 Monet married Camille Doncieux, the model for his celebrated Déjeuner sur l'herbe. On the outbreak of the Franco-Prussian War, Monet went to London, as did Pissarro. After the war Monet settled in Argenteuil, then in Vétheuil in 1878, and Giverny in 1883. In 1872 Monet produced his celebrated painting Impression. Sunrise which, two years later, was included in the first Impressionist Exhibition and whose title was coined for the group by the critic Louis Leroy. In the 1890s Monet enjoyed financial success and purchased the house that he had been renting in Giverny, in addition to an adjoining plot that he used to enlarge the garden with a water lily pond, as well as having more studio space built. From 1888 he started to work in series. The first, devoted to haystacks, was followed by others on different motifs including Rouen cathedral, the Thames, Venice, and water lilies, the latter a subject he continued to paint until his death. In all these works Monet experimented with light at different times of the day. Between 1899 and 1901 he spent the winters working in London, painting his famous views of the Thames from the window of the Savoy Hotel where he stayed. Monet undoubtedly reworked all these compositions in the studio as what most interested him was not so much topographical accuracy as a study of atmospheric conditions. On the occasion of his 1904 exhibition, the critic Georges Lecompte stated that he had "never achieved such a vaporous subtlety, power of abstraction and synthesis." The last twenty years of Monet's life were spent almost entirely at Giverny. The artist had cataracts, for which he was finally operated in 1923, subsequently embarking on a period of intense work. In a letter to his friend André Barbier of July that year, Monet apologised for not receiving him as: "I have to be free at ten in the morning to return to work. For me this is an unparalleled pleasure. Since your last visit my sight has improved enormously. I work like never before and I am very happy with what I am doing. If my eyes were even better, the only thing I would ask for would be to live to a hundred." Sadly, this was not to be the case, and Monet died in his house at Giverny on 5 December 1926. His funeral service, which was private at his own request, was held on 8 December. A few months later at the L'Orangerie in the Tuileries, the French State opened to the public a permanent display of the large canvases of the Water Lily series that Monet had donated in 1918 and which were hung according to his instructions. They remained there, almost forgotten, for decades. Major Exhibition Devoted to "The Torments of Passion: The Dark Side of Sexual Desire"